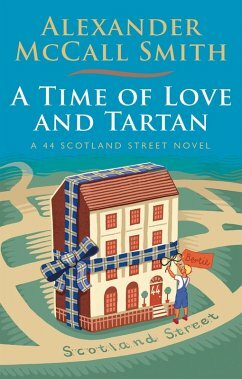 Catch up with the delightful goings-on in the fictitious 44 Scotland Street from Alexander McCall Smith . . . If only Pat Macgregor had an inkling of the embarrassment romantic, professional, even aesthetic that flowed from accepting narcissistic ex-boyfriend Bruce Anderson's invitation for coffee, she would never have said yes. And if only Matthew, her boss at the art gallery, hadn't wandered into his local bookshop and picked up a particular book at a particular time, he would never have knocked over his former English teacher or attracted the attentions of the police. Whether caused by small things such as a cup of coffee and a book, or major events such as Stuart's application for promotion and his wife Irene's decision to go off and study for a PhD in Aberdeen, change is coming to serial fiction's favourite street. But for three seven-year-old boys Bertie Pollock, Ranald Braveheart Macpherson, and Big Lou's foster son Finlay - it also means a getting a glimpse of perfect happiness. Alexander McCall Smith's delightfully witty, wise and sometimes surreal comedy spirals out to include tennis-playing Rwandan Forest People, researches into levitating Celtic saints, bogus headhunters in Papua New Guinea and primary school performances of Beckett. But its heart remains where it has always been true to life, love and laughter in Edinburgh's New Town.